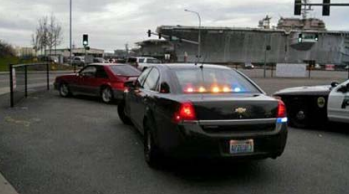 Bremerton police nabbed 24 drivers in just over an hour for driving solo in the HOV lane. Photo by Bremerton police. Bremerton police officers made a curious discovery last Thursday while patrolling the carpool lanes on Navy Yard Highway. As they peered into one of the cars they stopped, they noticed the driver, alone, had a carseat riding shotgun, with a blanket over it. And they found this not once, but twice, after only an hour and 15 minutes of patrolling. In total, five officers trolled the carpool, or High Occupancy Vehicle (HOV) lane, on Highway 304 between 3:45-5 p.m. The officers sat in traffic and watched for cars to go by in the carpool lane that looked like they had only one occupant. The HOV violations added up quickly, and by the time it was over, 24 tickets had been written. Strachan also noted that by their presence, traffic actually moved more smoothly as less cars moved along the HOV lane. And it won’t be the last time police will be out there.